Remember Nokia? They’re back again with their first Android smartphone under HMD Global, a company that owns the exclusive rights to produce mobile devices under the brand name Nokia. We are all excited about their return to mobile phone industry as they officially announced the latest Nokia 6 smartphone. And yes, it runs Android Nougat 7.0 Google operating system, not Windows Phone OS anymore. This new beast features full HD IPS display in 5.5 inch screen with Corning Gorilla Glass 3 scratch protection. In terms of performance, it is powered by Qualcomm Snapdragon 430 octa-core processor paired with Adreno 505 GPU to handle your multi-tasking process. For storage, you’ll have 64GB of internal space along with 4GB RAM and possible supports microSD card up to 32GB. 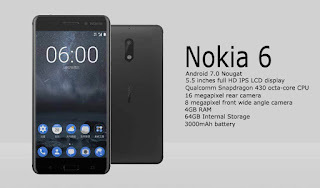 To add to your excitement, Nokia 6 sports 16-megapixels PDAF rear camera with 1.0um sensor, f / 2 aperture and dual flash. On the front side is the 8-megapixels wide angle camera with f/2 aperture that you can use to take selfie pictures. Check out other details like price, battery network connectivity and other features below. For now we are not sure when will it reach in Philippines market as the company announces that it is exclusively in China. We’ll have to wait for more months and surely they will include our country on their next release of the Nokia 6.